Y’all think it did, but it didn’t. Gold, I mean. Break out. Hang with me, I’ll explain. Okay, let’s roll back over it. Dollar topped at 100.04 in March 2015, then hit 100.02 on 2 December for a double top. Sluiced down out of that top, bottomed 12 February, tried to climb again but only reached its 50 DMA, and waterfalled yet again. The dollar has problems, whether we can see them or not. What are the stakes? 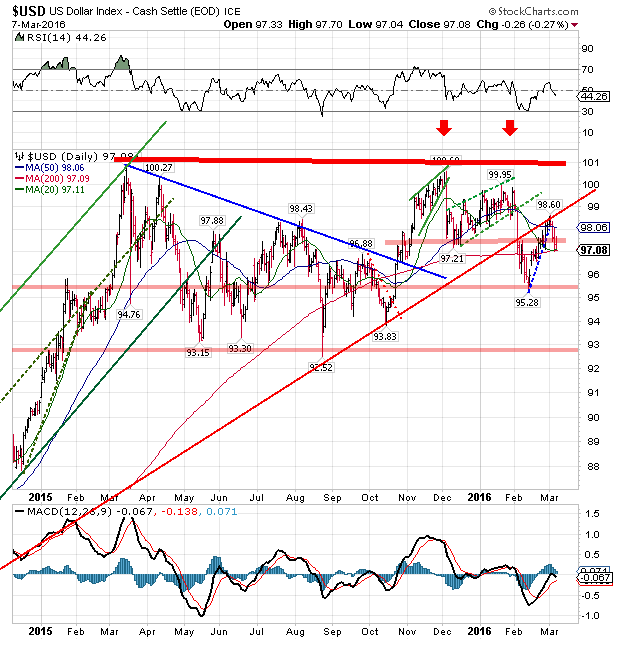 If the dollar closed below 92.52, it will have turned its upward trend that began in July 2014 DOWN. If it closes above 100.04, it will rally further. On the dollar’s course hangs much of gold & silver’s course. 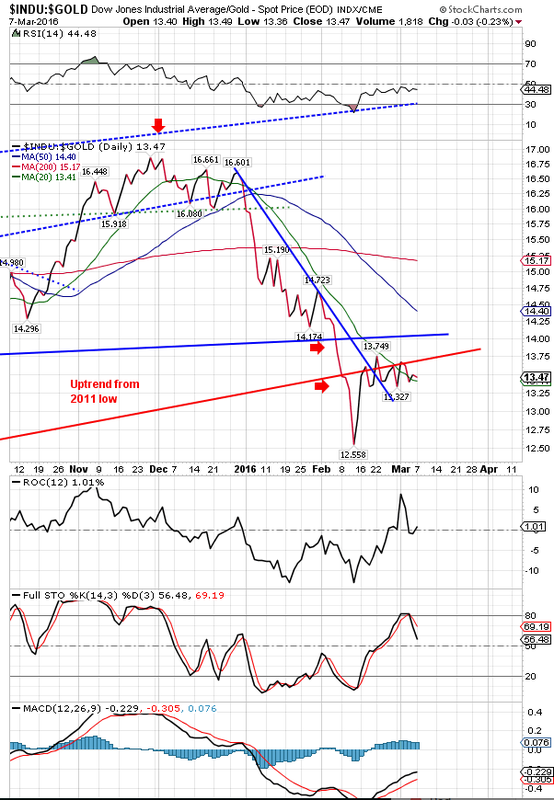 Dollar is signaling something unpleasant for itself and financial markets. I am unrepentant. Stocks have reached the upper range of where I imagined they might rally, but nothing has changed my outlook. I wouldn’t buy stocks with your money if you gave it to me AND a copy of tomorrow’s newspaper. Break already occurred in August. Dow rose 67.18 (0.4%) to 17,073.95 while the S&P500 eased up 1.77 (0.09%) to 2,001.76. Chart is dwindling into a terminal rising wedge. May hit the 200 DMAs (17,175.98 & 2,022.44) & I will lift my eyebrows in mild surprise but think nothing else of it. 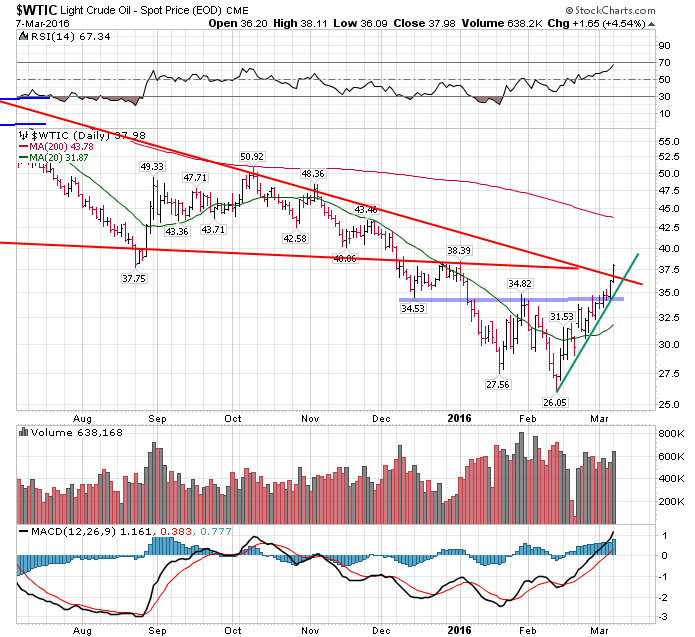 Oil, as West Texas Intermediate Crude, has been rising since 11 February. Last week it cleared $34.50 resistance and has even poked its head through the downtrend line from last June with today’s $37.98 close. It has made some kind of bottom, but let’s see how well it can improve it. Shooting for the 200 DMA at 43.78. Friday the GOLD PRICE shot up $12.50 (1%) to $1,269.90 while the SILVER PRICE exploded 55¢ (3.6%) to 1568.1¢. Today the gold price backed up $6.70 (0.5%) to $1,263.20. The silver price gave back 5.8¢ (0.4%) to 1562.3¢. Let me pretend for a moment I was born under the Sign of the Crawdad (instead of the Possum). 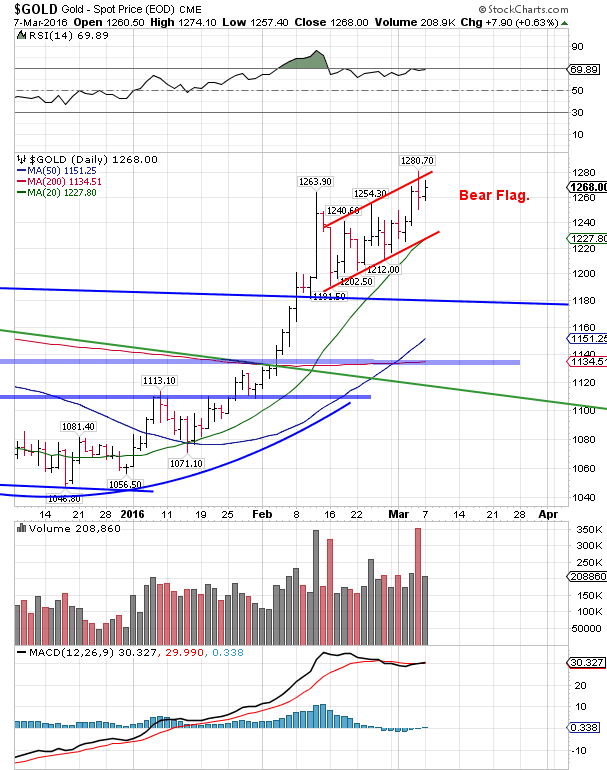 I know I said that if gold could close above $1,264 it would head toward $1,400. Yes, I did, I said that on Thursday, but the fact is gold close above that on Friday, and made nothing out of it. On the End of Day chart but not the Comex chart gold made a very bad move: it rose into new high territory but closed lower. That’s not necessarily fatal, but does hint that the price of gold hath not the horsepower to keep moving up. Poked its head up and turned timid. Add to that the Commitments of Traders numbers that just get worse and worse, hollering for a correction. Today the price of gold had another chance to build on Friday’s strength, but passed. 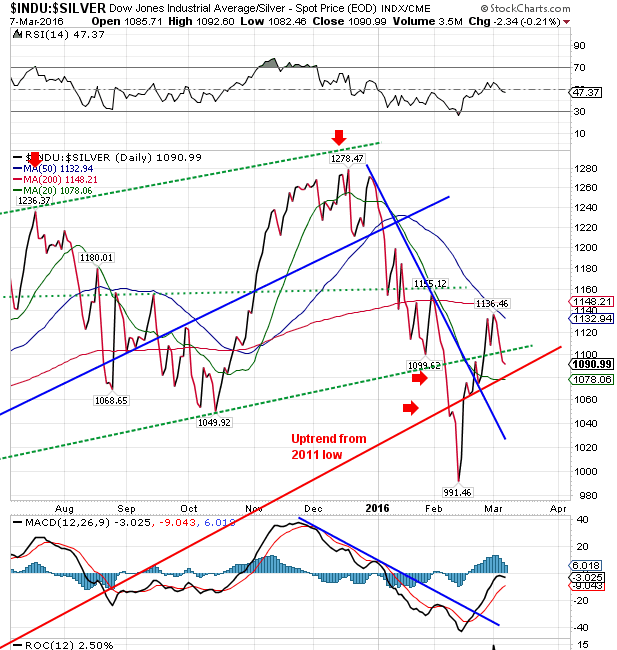 All this looks more like a correction brewing than a rally, I’ve got to confess. MACD indicator is trying to turn up, as is the Rate of Change. Friday it broke out of the downtrend ruling since the 11 February high at 1599¢. Hit 1579¢ — twice, because it did so again today without success. Remember that this 1560¢ level offered silver support from December 2014 through July 2015. Now it’s transmogrified into resistance and silver must pierce it. What’s needed now? Both silver and gold prices must better their previous performance. 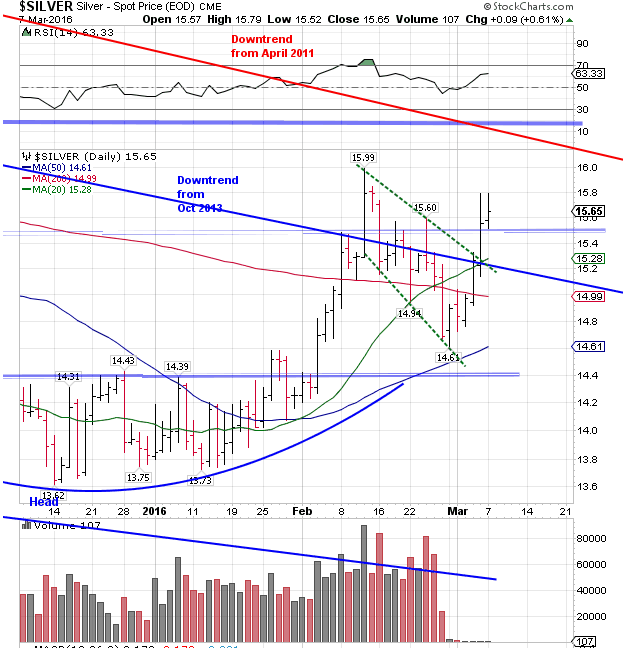 Hand in hand gold must break away through $1,270 and silver must BETTER 1599¢, the last high. Otherwise both will correct, and all the odds favour that correction soon. At Comex spot closes today the gold/silver ratio stood at 80.855:1. Yes, at that ratio I would still swap gold for silver, targeting a swap back into gold at 32:1 or lower. Well known is the market proverb, and justly so: “Bull markets always climb a wall of worry.” Also, in a bull market surprises always come to the Upside. I may be surprised here, but a metals’ correction seems unavoidable. I got everything bumfuzzled Thursday. The storytellers’ convention was at LaGrange College in LaGrange, Georgia, near Callaway Gardens. It was very interesting. Yes, Susan was right, it was worth the trip. We drove down to Callaway Gardens Saturday but nothing had started blooming. Going to Callaway Gardens when nothing’s blooming is like going to a pro football game where somebody’s stolen all the footballs.